Garber Metrology has been in the business of meeting the heavy capacity truck scale and rail scale needs of our Mid-Atlantic USA clients for over 35 years. We provide full service weighing solutions from truck axle weighing scales to multi platform truck and rail applications. Industries served include aggregate, feed and fertilizer, coal, food processors, chemical, waste management and manufacturing. We have available at your service 24/7/365 a competent staff of Heavy Capacity Master Technicians with over 150 years of combined experience ready to meet your most demanding heavy capacity needs. 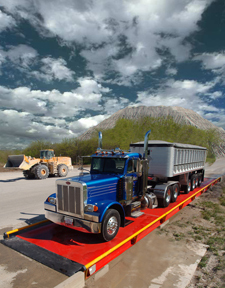 We maintain and operate four heavy capacity test trucks, each equipped with twenty 1,000 lb. weights, and a certified weight cart with an additional 5,000 lbs. We represent a broad range of styles and options including but not limited to full electronic or hydraulic, steel deck or concrete, above ground, pit or portable from some of the most prestigious manufacturers in the weighing solutions industry including Fairbanks, Winslow, Thurman, Weightronix and Rice Lake. If you are in the market for a new, used or rental truck or rail scale, we would encourage you to contact one of our customer care team members today to set up a personalized no-obligation site visit of your unique heavy capacity weighing application. We view your potential truck or rail scale as the cash register for your business and value the opportunity to provide experienced heavy capacity weighing solutions to your firm.